Welcome back Tailhookers to the Daily Briefing… The Blog has been in the yards for awhile, but with the help of all of you we’re going see if we can not only keep her afloat, but steaming in to the wind! 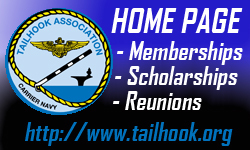 We’re going to cross deck and post a few articles directly from the print version of “The Hook” periodically to help gain exposure to a great organization. So today we’re posting a couple of them. This first article is written by CDR Matt Schnappauf, USN, Former Commanding Officer, HSM-70 who brings first hand knowledge and insight into the integration of Rotary assets with a Carrier Airwing. An article titled “New Paradigm for Carrier Aviation: Naval Aviation’s Helo Concept of Operations (ConOps)” was published in the Spring 2010 edition of The Hook by CAPT George Galdorisi, USN(Ret) and CAPT Donald Williamson, USN(Ret). The article discussed a new era in Naval Aviation, citing the inaugural 2009 deployment of HSM‑71 and HSC‑8 with Carrier Air Wing Nine in USS John C. Stennis (CVN‑74) as a “revolutionary way of doing business.” CVW‑9’s deployment was the first time an air wing deployed with its full complement of 19 MH‑60R/S Seahawk helicopters. The authors challenged Navy, Naval Aviation and Naval Helicopter community leadership to “determine how to capitalize and build upon the enormous new possibilities this Helo ConOps engenders.” Five years later, the HSM community has fully integrated into the air wing and is serving a critical role by helping maintain a focus on maritime warfare. The carrier air wing’s evolution over the past five years has significantly enhanced combat readiness and serves as a model for effectively embracing future progression. The MH‑60R brought remarkable capability to the air wing. In addition to serving as the strike group’s only organic air anti‑submarine warfare (ASW) asset, the MH‑60R aircraft is a capable anti‑surface warfare (ASUW) platform. HSM aircrews, critical to the development of a clear recognized maritime picture, routinely serve as strike coordination and reconnaissance (SCAR) assets for fixed‑ and rotary‑wing armed reconnaissance assets, effectively conduct electronic support (ES) missions and are capable of defending the CVN and high value units in either restricted waters or open ocean environments. The aircraft is equipped with the Airborne Low Frequency Sonar active dipping system, a capable ALQ‑210 Electronic Support Measures (ESM) system, either the AN/APS‑147 or AN/APS‑153 surface search radar and is capable of carrying and processing active and passive sonobuoys for ASW missions. The radar is effective at providing targeting solutions to other platforms due to its accuracy and minimal target location error. It also has inverse synthetic aperture radar capability and includes an imbedded identification friend or foe (IFF) interrogator capable of interrogating several IFF modes. The APS‑153 also includes the Automatic Radar Periscope Detection and Discrimination mode, which discriminates between small, medium and large targets, and highlights potential periscope detections to the operator. The AN/AAS‑44C(V)2c Multi‑Spectral Targeting System combines a forward‑looking infrared (FLIR) camera, a day camera, low light TV camera, a laser rangefinder and designator, laser target marker and an eye‑safe‑laser range finder. The MH‑60R is capable of employing the AGM‑114 Hellfire missile, Mk 46 and Mk 54 lightweight torpedoes, GAU21 (.50 cal) and M240 (7.62 mm) crew served weapons. Additionally, the Advanced Precision Kill Weapon System (APKWS) laser guided 2.75 mm rocket is being introduced to enhance the platform’s precision strike capability. Data fusion may be one of the most valuable and quickly developing contributions the MH‑60R offers the carrier air wing and strike group. The ability to fuse and share critical information from manual tracks, ESM, radar, IFF, FLIR and Link 16 systems is a force multiplier for improving situational awareness and kill chain effectiveness. Data fusion enables HSM aircrews to simultaneously provide accurate, time critical information to other aircraft, operational Composite Warfare Commander (CWC) concept commanders and the strike group commander. The MH‑60R provides applicable information to capable strike group assets via Link 16 and to the aircraft carrier Tactical Support Center (TSC) via a Ku band link system. Cruiser and destroyer combatants currently receive information from capable MH‑60R aircraft via a C band link system, but planned Ku band upgrades will ensure full wideband connectivity exists across the carrier strike group. By themselves, these systems provide significant informational value to the strike group, carrier air wing commander, CVN commanding officer, Sea Combat Commander, Command and Control Warfare Commander and Air Defense Commander — warfare commanders within the CWC construct. The revolutionary value of these systems, however, is the decision‑level quality of the information being shared across all sea control kill chains. The quality and efficiency of information sharing has greatly improved with the complete, seamless integration of the MH‑60R within nine air wings for the past five years. CVW‑8’s recent predeployment work‑up cycle and subsequent deployment with Carrier Strike Group Two and George H.W. Bush (CVN‑77) exemplified such integration. Tailored Ship’s Training Availability (TSTA) on board George H.W. Bush brought the air wing together at sea for the first time since CVW‑8 returned from its previous deployment in 2011. HSC‑9 and HSM‑70 focused on rotary‑wing integration during TSTA, establishing and refining common operating procedures. Air Wing Fallon (AWF) laid the foundation for greater interoperability by bringing all air wing squadrons together at Naval Strike and Air Warfare Center to train across a wide spectrum of mission sets. This training opportunity was critical to defining inter‑squadron and inter‑staff processes, facilitating relationship building between squadrons, increasing cross‑platform knowledge and promoting air wing esprit de corps. HSM aircrews participated in a wide range of events at AWF to include moving vehicle targeting, electronic surveillance, dynamic targeting, surface to air counter tactics, humanitarian assistance and disaster relief, and simulated maritime strike missions. HSM aircrews were assigned to mission planning teams and HSM maritime strike leads under instruction led specific large‑force employment (LFE) events. The introduction of a maritime strike lead qualification into the CVW‑8 Strike Lead And Rescue Mission Commander program further facilitated integration and tactical coordination. A robust maritime strike lead syllabus was developed to qualify MH‑60R aviators as strike leads for LFE scenarios in the maritime environment. The syllabus consists of the Strike Leader Attack Training Syllabus course at AWF; a war at sea exercise integrating the Sea Combat Commander to control fixed‐ and rotary‐wing strike assets against conventional and small boat threats; a Joint maritime defense event integrating ship, fixed‑wing and rotary‑ wing assets against fast attack and fast inshore attack craft threats; a strait transit event integrating with fixed‑wing alert and rotary‑wing assets against small boat and ASW threats; and a multiplatform ASW event. On deployment, HSM maritime strike leads led all restricted water strait transits and coordinated multiple air operations in maritime strike warfare (AOMSW) training events that included participation by the full complement of organic air wing assets, U.S. Air Force F‑15 Eagles and Strike Eagles and U.S. Army AH‑64 Apache attack helicopters. HSM pilots, along with their rotary HSC counterparts, stood Strike Warfare Commander and Air Resources Element Coordinator watches and participated in the air wing’s temporarily assigned duty rotation to the Combined Air and Space Operations Center (CAOC) in Qatar. Helicopter Maritime Strike squadrons are uniquely suited to maintain focus on the maritime domain, which is especially valuable considering that carrier air wings must balance competing requirements driven by overland operations. One of the more significant accomplishments realized during the CVW‑8 deployment was the establishment of a cross‑functional working group that coordinated efforts on behalf of Commander Task Force 50 (CTF‑50) and CVW‑8 to align all tactical guidance for the Combined Air Operations Plan (CAOP) for the Defense of the Persian Gulf. HSM pilots were critical in coordinating a team effort that effectively aligned the CAOP, the Persian Gulf baseline Special Instructions (SPINS), AOMSW Appendix to the SPINS and recently released Commander, U.S. Fifth Fleet Operational Task instructions. For the past few decades, carrier‑ based air power has been keenly focused on supporting overland operations in Iraq, Afghanistan and most recently, Syria. Although the U.S. Navy is not currently engaged in a war at sea, maritime warfare remains a core competency — especially given advances by potential maritime peer competitors. Navy helicopters have been effectively conducting sea control missions from cruisers, destroyers and frigates since the establishment of the Helicopter Anti‑Submarine Squadron Light (HSL) community with the SH‑2 Sea Sprite in the 1970s. U.S. Navy ASW and ASUW capabilities were further enhanced when the SH‑60B Seahawk was introduced in 1984. The MH‑60R is a significantly more capable platform than its predecessors, making it ideal for augmenting other platforms or filling gaps in key sea control kill chains. Although all naval aviation communities must be proficient in maritime warfare mission areas, evolution has presented an opportunity to maintain a persistent air wing focus on this perishable skill set by leveraging the HSM community, while still facing competing overland requirements in theater. It is worth noting that the largest maritime battle fought by the United States since World War II was fought less than 30 years ago in Operation Praying Mantis. During the tanker war between Iraq and Iran, U.S. Navy surface combatants and their embarked Light Airborne Multipurpose System (LAMPS) SH‑2 and SH‑60B helicopters served as escorts to Kuwaiti flagged tankers in the Persian Gulf. Praying Mantis took place 18 April 1988; four days after Samuel B. Roberts (FFG‑58) struck a mine 55 nautical miles north of Qatar. During Praying Mantis, CVW‑11 jets flew from Enterprise (CVN‑65), outside of the Persian Gulf, to coordinate with U.S. Navy surface combatants, Navy helicopters and U.S. Army helicopters to sink multiple Iranian warships and to attack Iranian oil platforms. Carrier air wings must maintain the ability to effectively conduct coordinated maritime warfare, particularly due to the unpredictable nature of future requirements. “Naval Aviation’s remarkable, innovative and evolutionary journey” was highlighted by the former Air Boss in his article titled “U.S. Naval Aviation Evolving,” published in the Winter 2014 edition of The Hook. Just as VADM Buss discussed the significance of F‑35C testing on board Nimitz (CVN‑68), carrier aviation’s ability to evolve has been clearly demonstrated over the past five years. This evolution has enhanced combat readiness and positively impacted air wing effectiveness. Despite such exceptional progress, there will always be room for improvement. To remain a relevant and powerful carrier striking force, we must continually seek innovative ways to maximize the capabilities of all assets against future emerging threats. The future of Naval Aviation will include F‑35B/C, unmanned systems such as the Unmanned Carrier Launched Airborne Surveillance and Strike (UCLASS) vehicle, and a continued focus on interoperability with Joint and coalition partners. Our ability to maintain maritime supremacy will assuredly be linked to continued innovative integration of new platforms and the effective employment of complimentary capabilities.